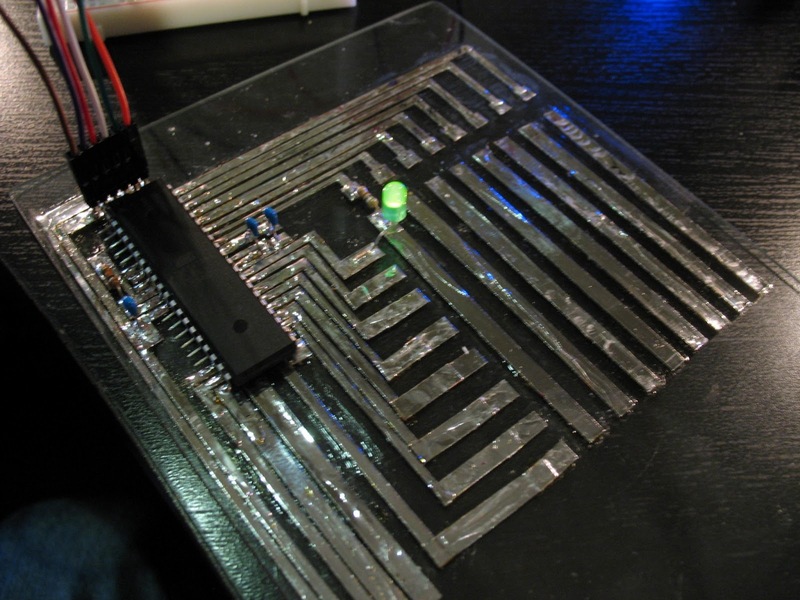 I was inspired by CNLohr to create my own glass circuit board. 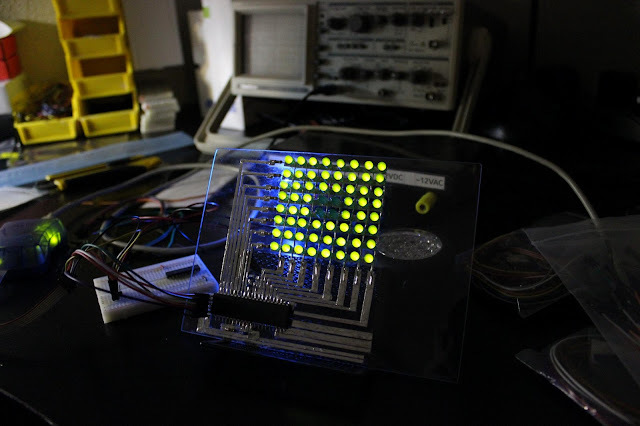 I decided to create a 2D LED matrix because the layout is simple enough to fit onto a single sided board. I decided to take a different approach than CNLohr took. 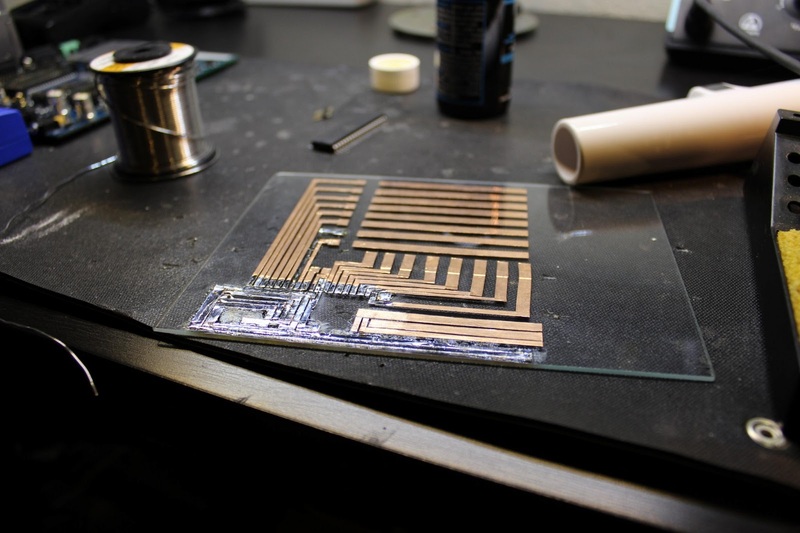 Rather than adhering a layer of copper to the glass and etching out the traces, I used copper tape and glued each trace to the glass. 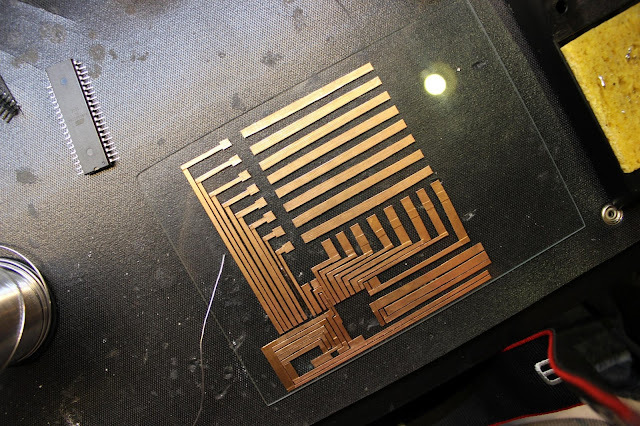 Unfortunately this takes away the printed aspect of PCB manufacture but it allowed me to complete the project using parts that I found in a local craft store. I wanted to make a desk ornament. I work in an Electrical Test group and any kind of gizmo like this is worthy of some geek credit. I originally wanted to create a 7-segment clock, but decided that they layout was too difficult to execute on a single-sided layout. Perhaps if I had some 74HC595's around it might have been easier. 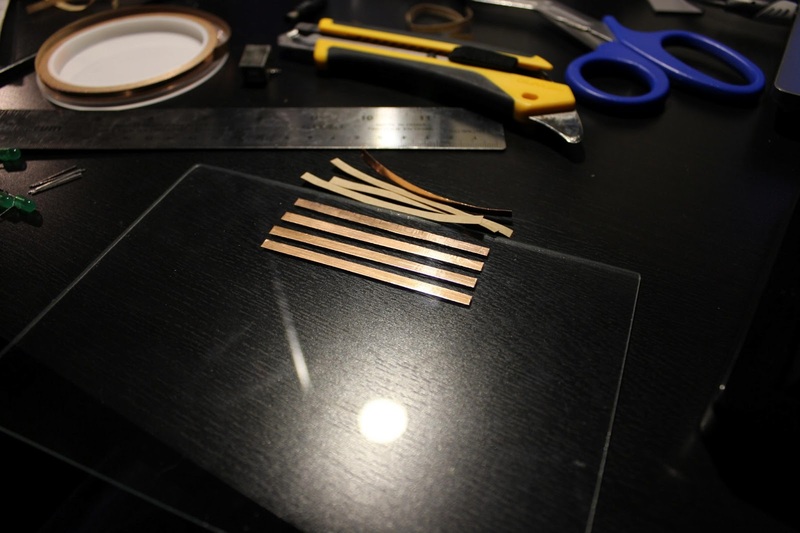 The first thing I did was stop at a Michaels Craft Store to purchase glass and copper tape. I opted for a 2D matrix. This would allow me to display a wide range of graphics and would easily fit onto a single-sided layout. 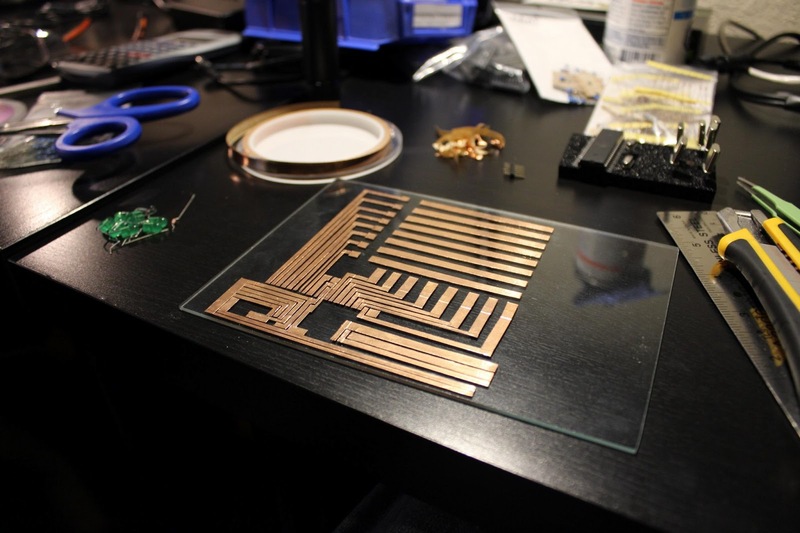 I captured and laid out a circuit board to help me build the device. The final product vaguely resembles what I designed in Eagle but it served as an excellent guideline. Once I had the layout roughly completed I started to cut and paste each trace onto the glass. I was careful to apply firm pressure to each piece of copper. This process took several hours, but my speed increased with each trace as I gained dexterity. 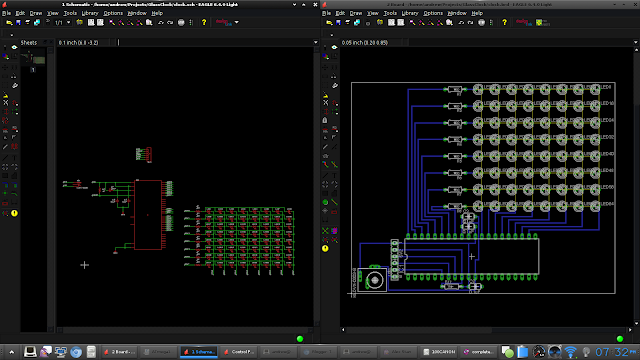 Once I had the LED traces completed, I had to create the traces for the AVR Microcontroller. This was surprisingly easy as the pitch of the pins is relatively large. I decided to mount the through-hole microcontroller by bending the legs so that they could be surface mounted. The results were excellent. The final step was to route the programming pins and power rails. 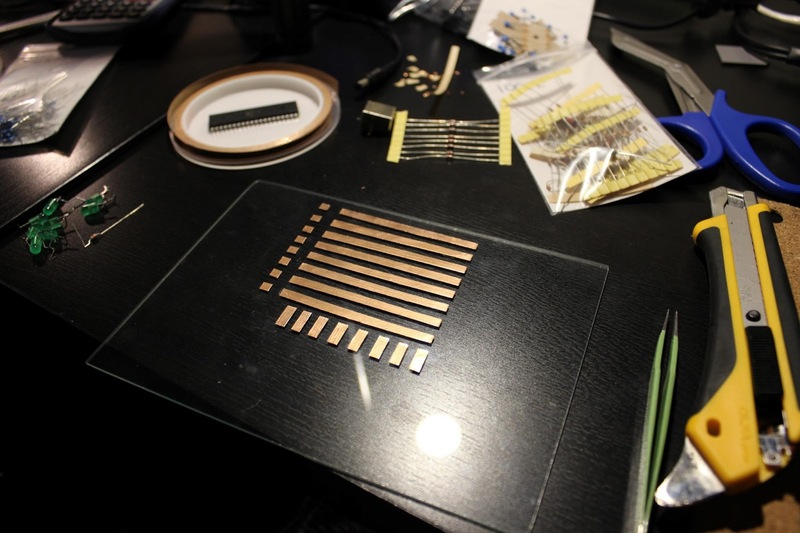 I also added in three traces for future expansion (RGB LED) at the last minute. These were not included in my Eagle layout. You can clearly see the traces that will be under the microcontroller here. They are very close together. 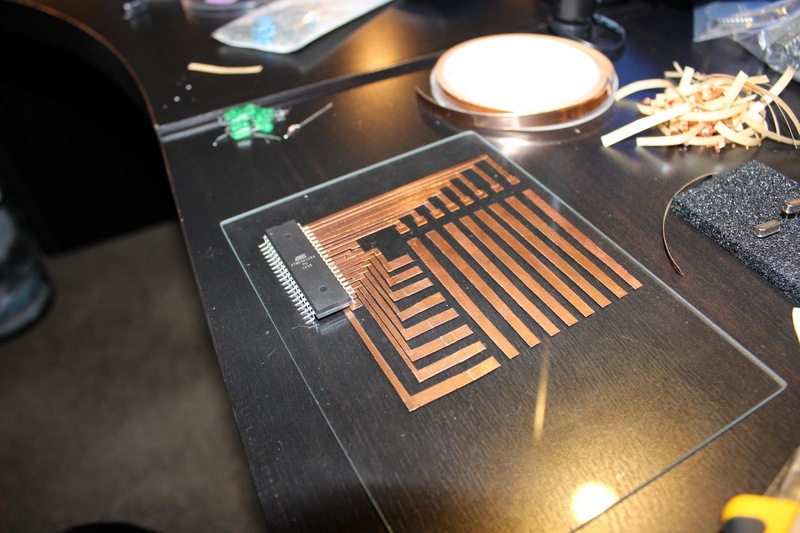 The next step was to apply a good coating of rosin flux and coat the traces in solder. This provides good connections between the overlapping traces and ensures that everything is mechanically sound. 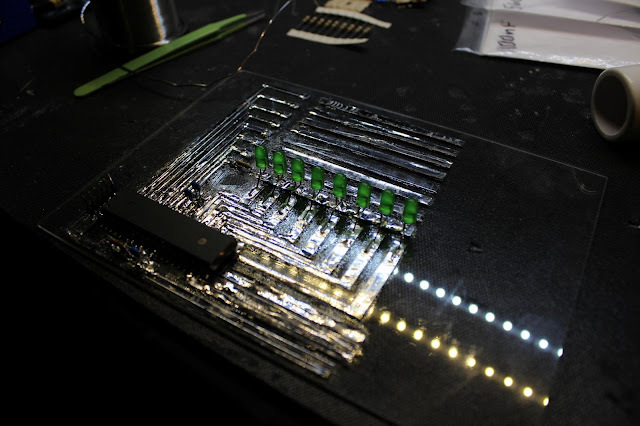 Once I finished tinning all of the traces I mounted my microcontroller, decoupling capacitors and my first LED. I wrote a quick program to turn the LED on and powered it up. On my first attempt at programming the board, there was a small short between MOSI and ground. I cleared this issue up and managed to successfully program the board. The LED turned on! Tinned Traces, Mounted Components and First LED! 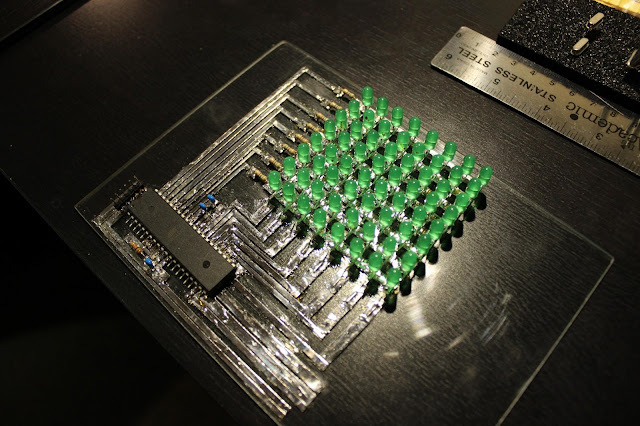 I mounted the remaining 63 LEDs to create the matrix. I cleaned off the rosin flux using some 100% Isopropyl Alcohol in an aerosol can. Thankfully, none of the traces shifted or moved. Hopefully I have provided enough information for you to go out and build your own. Thanks for reading! Very COOL ! When I fist saw it I thought you etch the copper patterns. I used to do that but don't like messing with the chemicals. Good idea on the copper tape. I'll have to check out Michael's. Take care. 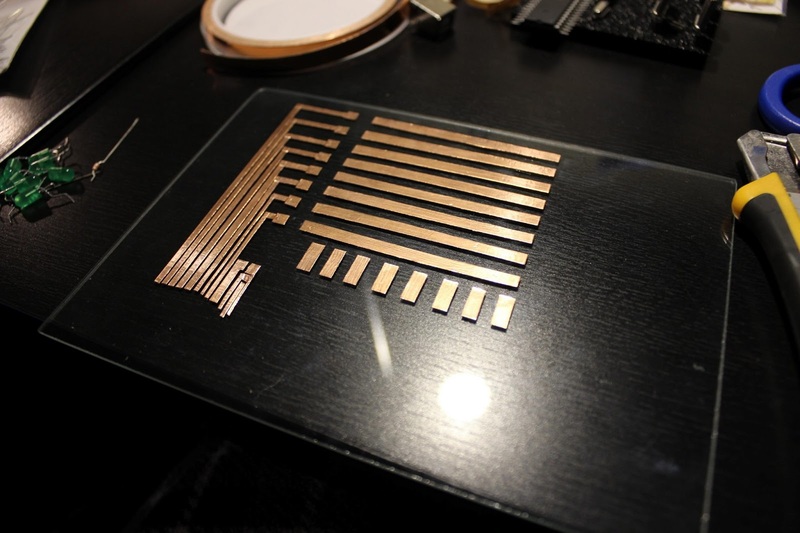 Could you have substituted very thin (<32 ga) wires for the copper traces on the long runs? 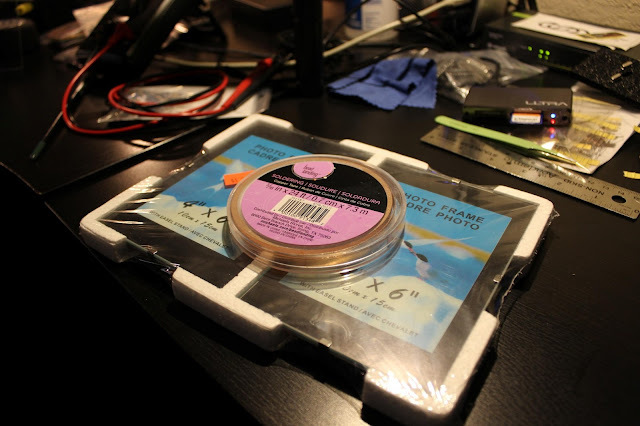 I'm wondering if it might work with copper pads and then cyanoacrylate glue for the (very thin) wires, to reduce the amount of obscured glass. That is not a bad idea at all! It might be a tad more fine work to do that, but it would probably work quite well. Assuming you want to keep the "clear" aspect, you might need to be careful about how much CA glue you use, and potential 'crazing' (turning white) from too high humidity. I've usually been able to avoid the CA glue white hazing by keep a fan on it for a long while (several hours). Cool..May be you can play some game in this Array. Like a snake game or the game of life.